In his second rehab appearance, Red Sox starter Clay Buchholz went 3 1/3 innings, throwing 53 pitches (34 for strikes) at Pawtucket. 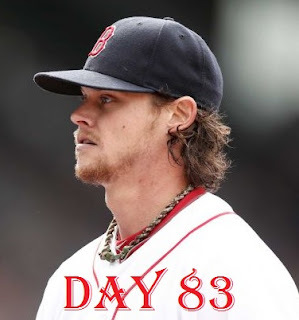 Buchholz gave up seven hits, one earned run with two strikeouts and more importantly he made it through healthy. "Tonight, I was much more impressed with the velocity that I was able to sustain over the period I was out there and getting over that hump of not having to worry about anything when I'm trying to get a fastball down and away to a righty with something on it. I was able to throw all of my pitches with the same effort level and the same arm angle." Although Buchholz's command was much better than his last outing, he left the game with one out in the fourth inning after a hard hit double. In his first rehab start, last week with the Lowell Spinners, Buchholz struggled. He didn't make it out of the first inning, recorded only two outs while giving up three runs and three walks. Buchholz is expected to make one more rehab start, likely Wednesday, before returning to the Red Sox rotation. If all goes well, it's expected Buchholz will start against the Tampa Bay Rays at Tropicana Field September 10. Welcome to the playoff race, Clay. Where ya been?